technology can reap big rewards, it isn’t something that happens easily. Savvy businesses understand that they can’t just purchase a new social solution, plug it in, and meet the needs of their customers overnight. 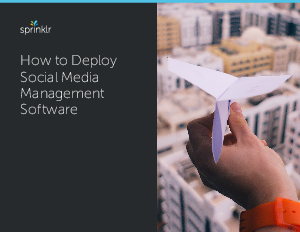 Organizations must go about social deployment in a way that allows the highest possible return on investment, empowers them to capture new opportunities, and manages the risks inherent in social media. With that in mind, what does the ideal social deployment look like? How can leaders encourage digital transformation by using social media management software efficiently? And how can companies ensure they deploy social platforms in a way that aligns with their overall objectives? In the following pages, you’ll find step-by-step instructions for successfully deploying, scaling, and maintaining a new social media technology.